Physical / Why is my baby going backwards, instead of forward, when attempting to crawl? We’ve previously discussed how crawling can occur between the 6- to 10-month mark. We’ve also talked about the different styles of crawling and how your little one can adopt other kinds of movements, like rolling or shuffling to get around. 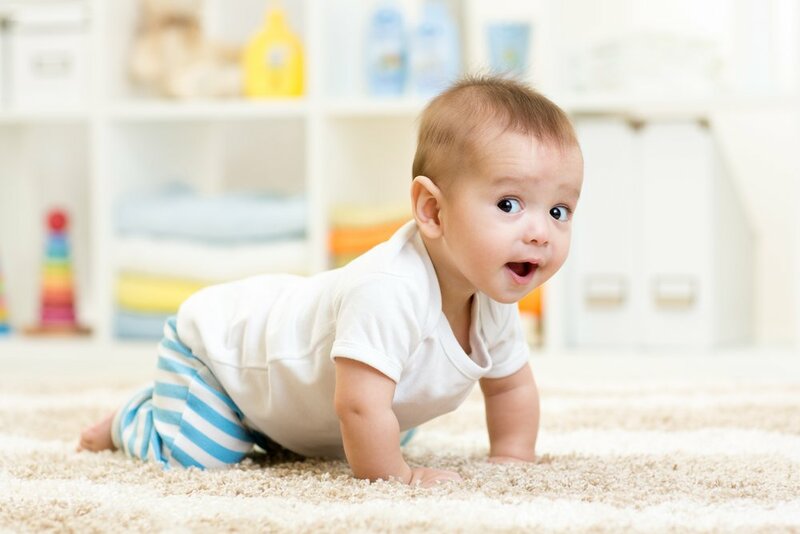 During this learning process, you might see your baby go backwards first before getting the hang of crawling forward. Why? As your baby explores the world, he uses his arms and upper body as a first approach when playing or exploring something. During tummy time he uses his arms to lift himself up and support his neck; this is very important to get him ready to crawl. By doing so, he’ll develop the strength needed to get into a crawling position, and his upper body muscles will develop faster than the lower ones. That’s why, as he explores, he might find it easier to push instead of pull, when he attempts to move. Since your little one’s arms are more developed than his legs, you might see him push himself back further away from the toy he wants to reach. Because all the strength is primarily focused on the upper part of his body, your baby might need your help to understand the mechanics of crawling and how to start pushing his body forward with his legs. When you see he is ready to make his move, place your hand behind his feet to act as resistance and help him move forward. Practice tummy time exercises and show him how to use his legs to support his body and strengthen his lower muscles. As you practice and strengthen those muscles, try playing catch and see if your little one crawls away or chases after you. With time and practice he’ll discover that, by digging with his knees and pushing off the ground, he can propel himself towards the target of his choice. The important thing is that your baby is able to explore his surroundings and strengthen his body in preparation for walking. As long as he is learning to coordinate both sides of his body using his arms and legs, there’s no reason to be concerned. If you feel your child is not moving normally, you can always talk with your pediatrician. If you want to know more about this subject you can visit: Movement 8 to 12 Months.